When God Asks the Questions: do you believe this? Yesterday was All Saints’ Sunday. It was also Communion Sunday. Two of my very favorite worship experiences on the same day. every one of which I love. those who have died in the year just past. lit votive candles sit on a table at the back of the center aisle, and during the opening worship song, we are invited to pick up a candle and bring it to the front, placing it on the shelves to the side of the chancel. Those who wish to remember loved ones who have passed from this life to the next are invited to do so in this tactile and beautiful way. It always moves me to tears. I carried a candle for our son-in-law and for my youngest brother yesterday. My husband carried a candle for his father and mine. At least 40 people streamed forward with candles, adding their small lights to the gathering brightness in the front of the sanctuary. It provided a beautiful focus for the service which followed, most particularly for the sermon built on John 11’s story of Jesus’ encounter with Martha and the subsequent raising of Lazarus from the dead. Check it out in John 11:17-44 – it’s one of the all time great conversations in scripture, to say nothing of the miraculous activity that follows it. 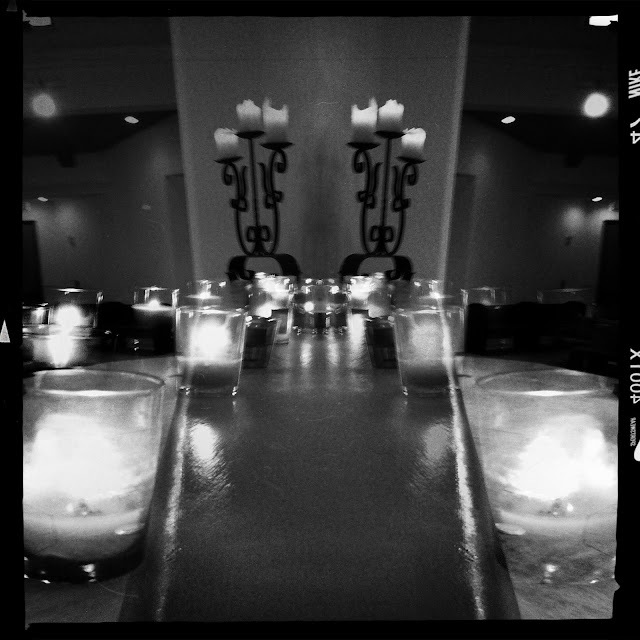 The photo below was taken by our pastor using the hipstmatic app on his iphone. It created a mirror image of one of our candlelit shelves – and is lovely in it’s black and white simplicity. Thank you, Don – for the picture and the sermon. How many times have I heard this question asked? How many times have I asked it myself, offering these words as a call to worship at a memorial Service of the Resurrection? that she truly understood what she was saying. And I wonder – I truly WONDER. I am awestruck at her simple, clear faith. For in truth, who of us ever understands what this means? of suffering and enemy occupation and senseless slaughter. It is an astounding claim, when you think about it. one of his best friends who was seriously ill. He makes strange noises about glory and death not being death. he speaks to her with confidence and tenderness and hope. He surprises her with his question, I think. And she blurts out her gut response. as he walks. So struck that he himself weeps. Death is so clearly the enemy in this story. these are the things that bring tears to the Savior. He patiently endures the blame – from the sisters, these ones who are part of his inner circle, the women who have seen him and known him as few others have. as he climbed to that tomb. “He loved him – but couldn’t he have done something to prevent all this weeping? And then comes the command: Take away that stone! Martha – bless her – Martha once again speaks before she takes time to think. How this line cuts me to the quick, every single time I read it. And then, the prayer of thanksgiving, offered BEFORE the miracle. trailing his burial cloths, Lazarus walks out of his own tomb. a God who raises the dead. And something inside my spirit begins to ring like a tuning fork. Yes, I recognize this deep truth, this call to freedom. from truly living my life. Sometimes I need help to get rid of them. And sometimes, so do you. That’s why we’re together on this journey, isn’t it? To help each other believe. To help each other believe that we serve a God who raises the dead. Release each other to fullness of life. Joining this Monday, as I do most Mondays, with Michelle over at “Graceful” and tomorrow with the soli deo gloria sisterhood at Jen’s place, “Finding Heaven. We believe and your words help our unbelief! Thank you again. It was great to share part of the day with you. I love my community — both in church and online (including you!) who help me believe in the day-to-day!